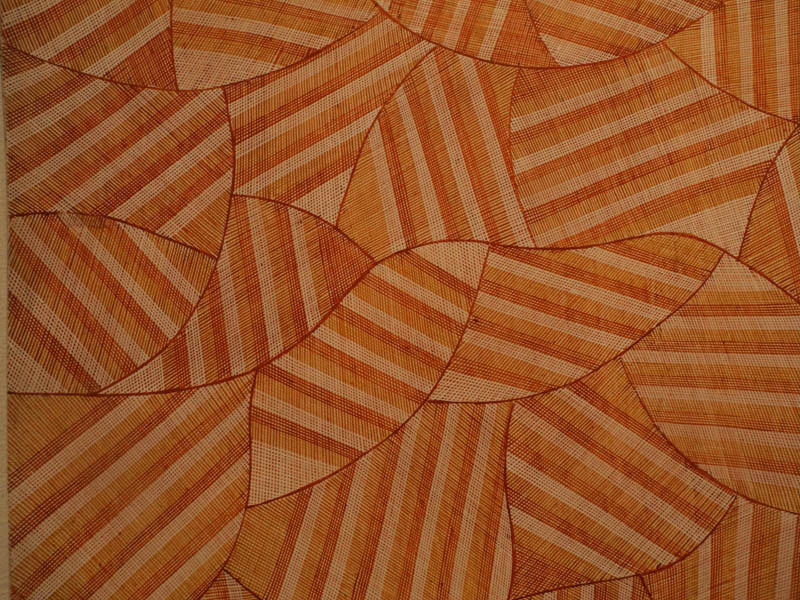 Ivan Manirrkki, Untitled, 2007; ochres with PVC fixative on stringybark. I just visited an exhilarating exhibition at the Hood Museum of Dartmouth College: Crossing Cultures: the Owen and Wagner Collection of Contemporary Aboriginal Australian Art at the Hood Museum of Art. I thought I knew contemporary Aboriginal painting, having visited Australia in 1988 and seen a large exhibition at Asia Society the same year, but nothing prepared me for the power, presence, and sheer beauty of the works on display. I don't know if this was because I am more receptive to the work now, or because in the intervening years the quality and intensity of the paintings has soared; whatever the reason, I spent a long time wandering the galleries, photographing works. 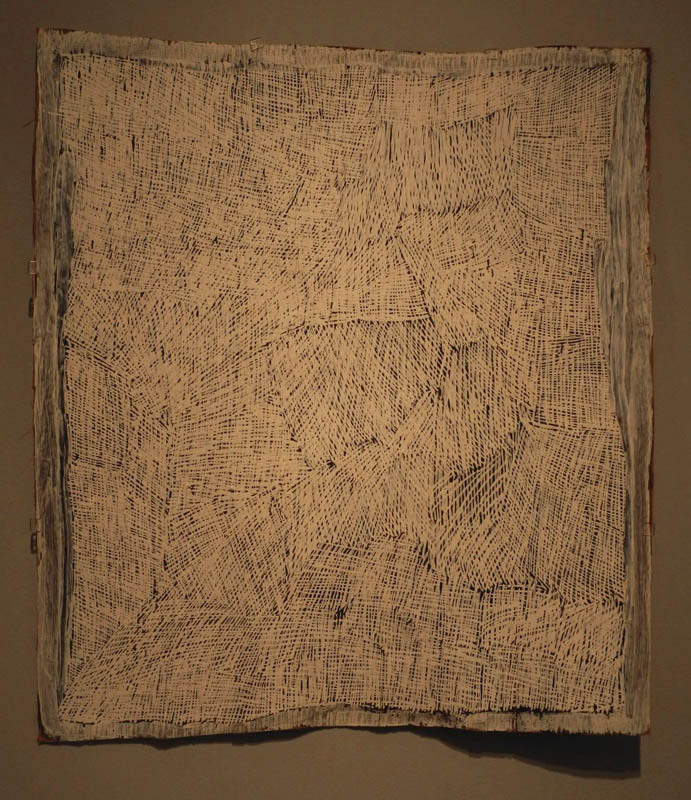 I saw so much that I loved that I will write two posts on the show: this first one on the paintings on bark, and another on paintings on canvas. 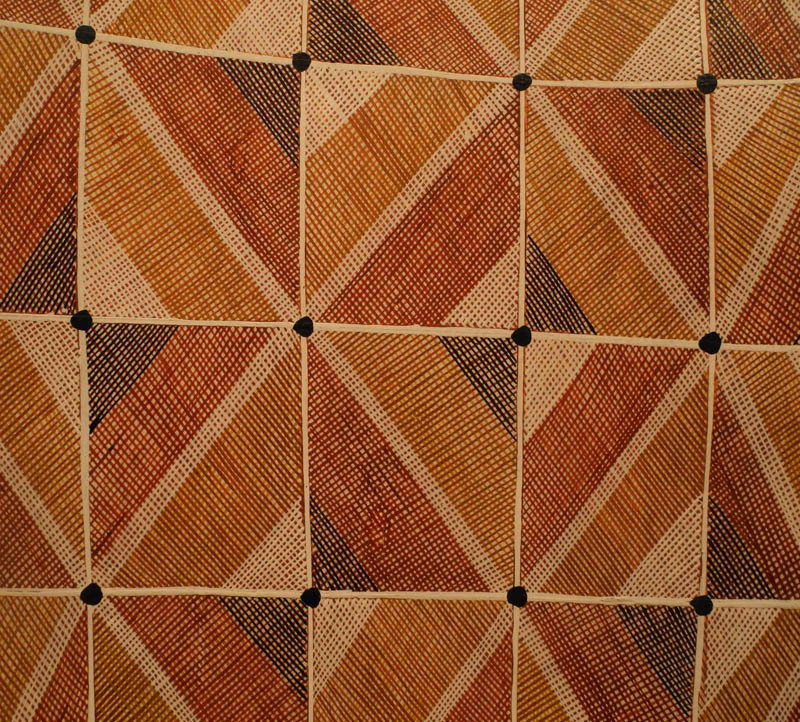 The bark paintings are made by the indigenous peoples of Northern Australia, using natural pigments for their paints. The patterns and images are all deeply symbolic of land and history and culture; a wall label describes them as "metaphysical landscapes". 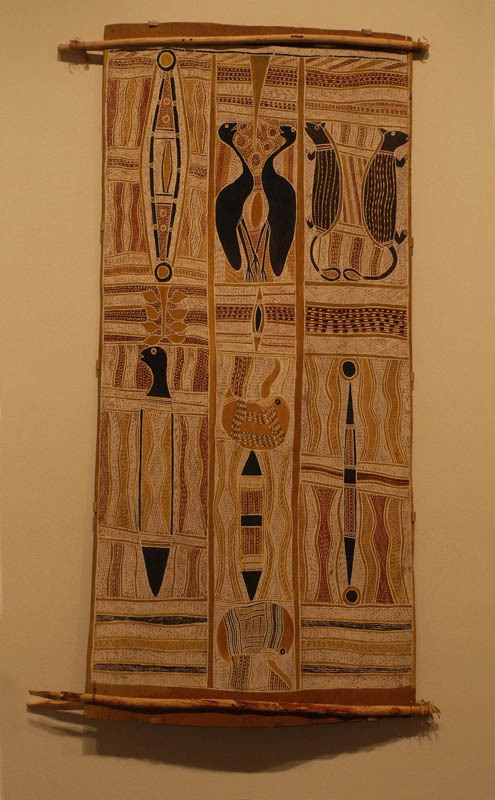 The iconography of Manirrkki's painting is described as invoking "sequences of songs, dances, colors, and body designs used in closed ceremonies that are anchored to specifics of place". The very careful, close cross-hatching that is used in many of these paintings is called rarrk. The focus required to paint these delicately overlapping lines adds a meditative quality, as does the understanding that these designs are tied to place and to ancestors. I am sure that these layers of meaning, embedded within the making of each painting, are a primary reason that I find the paintings so compelling and moving. John Mawurndjul, Milmilngkan, 2001 and Mardayin Ceremony, 2003; ochres on stringybark. John Mawurndjul is an important contemporary painter, whose images are of ancestral landscapes and beings. The painting at the left shows the lands of the Kuninjku created by the Ancestral Being Ngalyod (the Rainbow Serpent) who lived at the water hole at Milmilngkan. This painting too is said to be abstracted representation of the ancestral landscape. The wall labels at the show were very useful for iconographic details. For instance, I learned here that the designs of this painting were modeled after ceremonial designs the artist's ancestors wore on their bodies, "symbols now said to connect initiates to the sacred power of those ancestors". 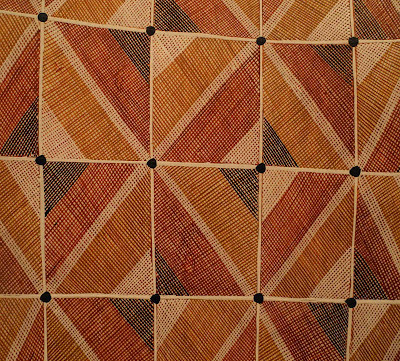 Aboriginal painting on portable, lasting materials is a 20th century activity; before that paintings were made on sand, or more permanently on rock. Information on technique was less in evidence on the labels, though this one did state that Mawurndul used his own hair for paint brushes. And indeed, when I watched a segment of a video at the museum, I saw him painting with a fine, long haired, obviously home-made brush. The video also showed him clambering up a eucalyptus tree to cut the bark for his paintings. The pigments, ochers and charcoal and chalk, are gathered locally and used with traditional resins, such a tree sap, or with modern PVC. 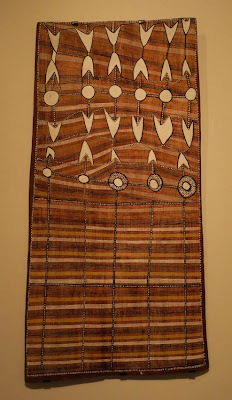 Samuel Namunjdja, Gungurra (Wind Dreaming), 2006; ochres on stringybark. This stunning painting is not simply an artistic invention, but an invention to describe winds and cyclones in Namundjdja's home of western Arnhem Land. Also using rarrk, the painting is described as referring to a site near Namunjdja's clan estate associated with an ancient ceremony of cyclical regeneration. 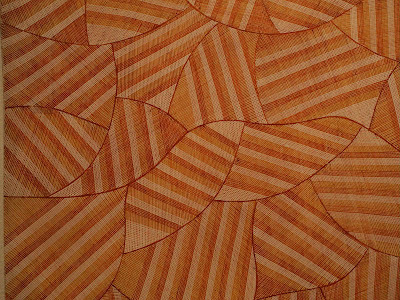 Kay Lindjuwanga, Mandjabu (Conical Fish Trap), 2005; ochres with PVC fixative on stringybark. The shape of a fish trap is evoked using very simple patterns and lines, so beautiful, clear, and present. 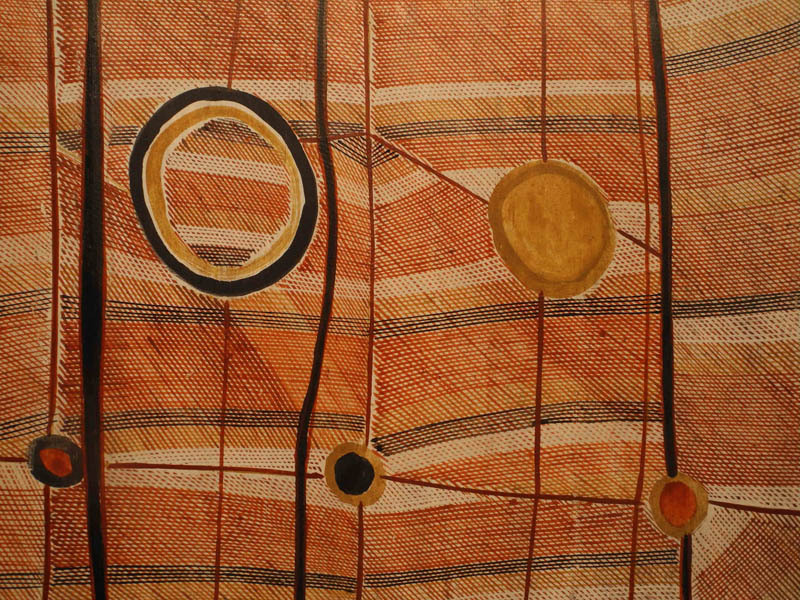 Jimmy Njiminjuma, Wakwak (Crow Dreaming), 2002; ochres on stringybark. 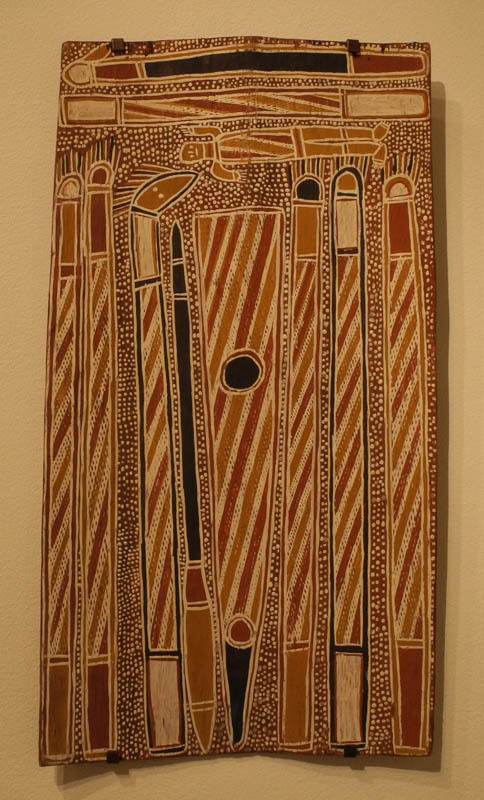 The artist Njiminjuma is a senior custodian of the Kurulk clan, and the iconography of this painting represents body paint design worn by its members. From the wall label: "The energy immanent in the design recalls the creative power of the Crow Ancestor in the Ancestral Period and allows the wearer to partake in that power." Is it any surprise that even a Western viewer without knowledge of these ancestral powers would still be affected in some subtle way by them? 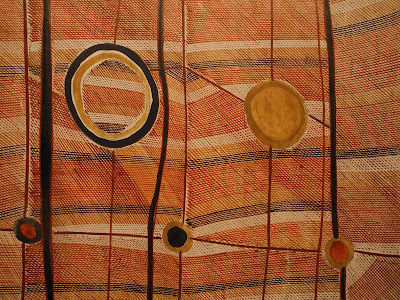 Abraham Mongkorrerre, Ngalyod Site at Milmilngkan, 1999; ochres with PVC fixative on stringybark. Mongkorrerre is representing the sacred site of Milmilngkan, where the Rainbow Serpent, the great creator spirit, lives. The white shapes are water lilies and water holes. The white creates a real drama amid the ochre colored lines of the painting. Here I want to say that even though these paintings are representations of sacred land and history, each artist approaches their subject with a fine sense of composition and color, each individual and surprising. 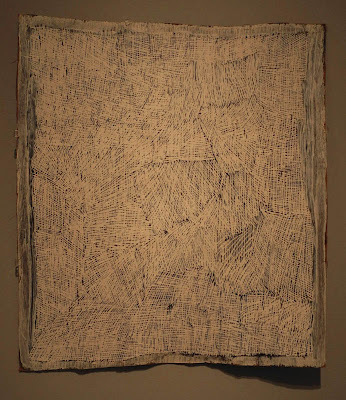 Nyapanyapa Yunupingu, White Painting #5, 2009; ochres on stringybark. Yunupingu's works are different from the others I've shown in that she paints personal lines and shapes, having nothing to do with ancestral meanings. The painting is vibrant with its white marks on a dark ground. 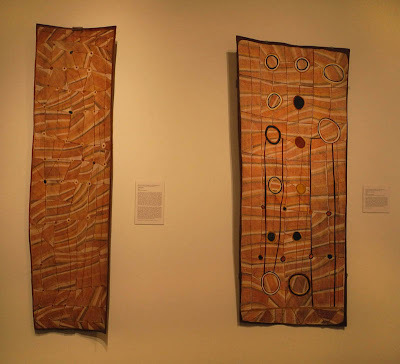 Dawidi, Girri (Wagilag Ceremonial Emblems), about 1965; ochres on stringybark. 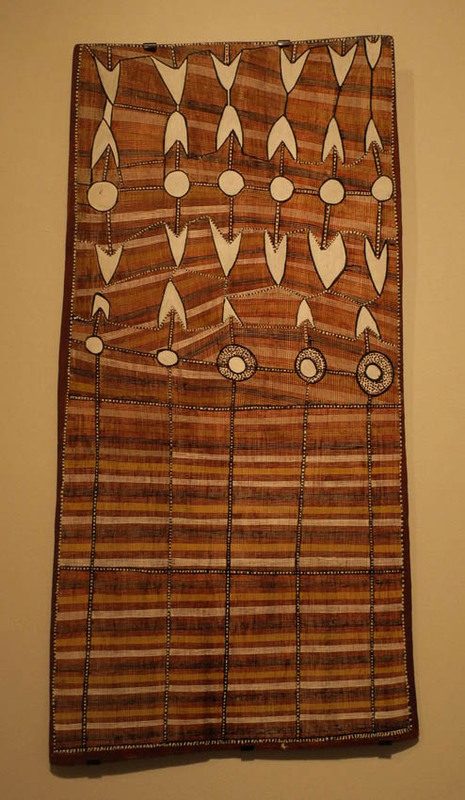 Narritjin Maymuru, Banatja Story, 1973; ochres on stringybark. 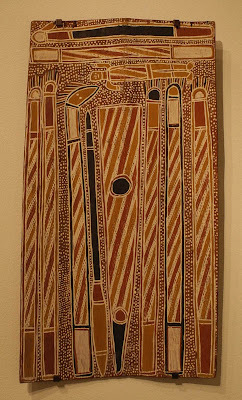 Peter Marralwanga, Namanjwarre, about 1981; ochres on stringybark. There were a few older works in the show, and from these three you can see how the style and use of imagery has changed. What remains constant is a very strong sense of surface design, a clarity and simplicity even in more complex compositions. Constant too, is the depiction of the power of ancestral beings, such as this amazing crocodile, once a man, now the overseer of fresh water. The combination of brilliant painting with a depth of meaning tied to ancient traditions makes these works remarkably compelling. *To read a post about the works on canvas in this exhibition, click here. *if you click on the images to enlarge them, you'll get a much better look at the paintings. What stunning work this is. As always, thank you, Altoon, for featuring something off the beaten path and deserving of attention. You're very welcome, Connie; I'm glad you like this work and I love sharing it. Love this! The colors are inspiration for all sorts of things. Thanks for posting. Thanks for the positive comment, Kay. I heard a lot about Aboriginal Art from my Australian friends, but don’t get chance to see this beautiful and creative art paintings. If you have some pictures of Aboriginal art paintings then please share some pics here!! A New Painting: "Untitled (Orange, Pink)"